CHIA can accept online donations from anywhere in the world! Through our partner, Global Development Group, we can accept online donations from anywhere in the world. 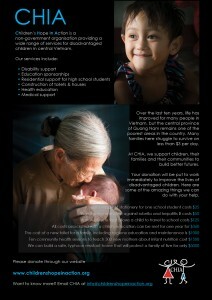 Donations to CHIA through Global Development Group are also tax-deductible for donors in Australia and the USA. Once you have made your donation, please tell us about it through the Supporter Information Form. This will allow us to issue your tax-deductible receipt (donors in Australian and USA only). If you are in a country other than Australia or USA, or you don’t require a tax-deductible receipt, please consider donating directly to our Australian bank account (details below). Donating this way gets your money to us more quickly, and with lower administration costs. Please also complete the Supporter Information Form after you have made your donation. If you are in Hoi An, come drop by our office, meet some of the CHIA staff and make a donation! We are close to the centre of town at 460 Cua Dai Street, Hoi An. Office hours are Monday to Friday: 8:00-12:00am and 1:30-5.30pm.